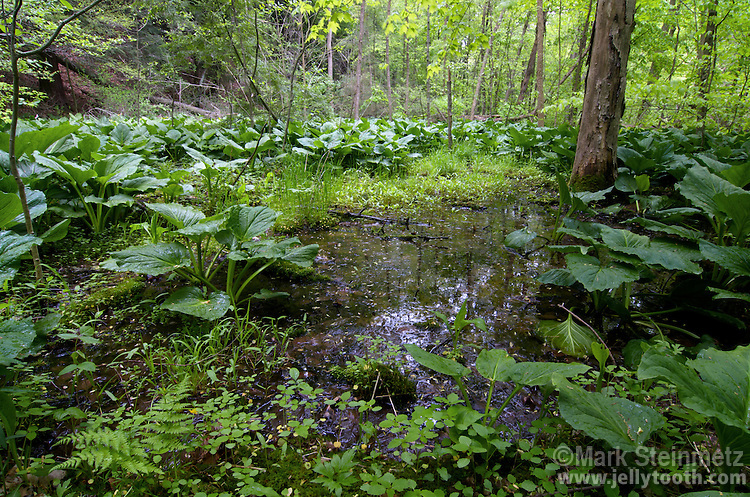 Vernal pool dominated by Skunk Cabbage (Symplocarpus foetidus - eastern US species). These ephemeral seasonal pools are devoid of fish, thus providing safe breeding habitat for many species of macroinverterbrates, frogs, salamanders, and turtles. Some organisms are considered "obligate" species, in that they depend on vernal pools for at least part of their life cycles in order to survive. Examples include Fairy Shrimp, Wood Frogs, and Spotted Salamanders.